Although busy with his activities as a member of Korean group GOT 7, Jackson Wang (王嘉爾) maintains a strong presence in both Mainland and Hong Kong. 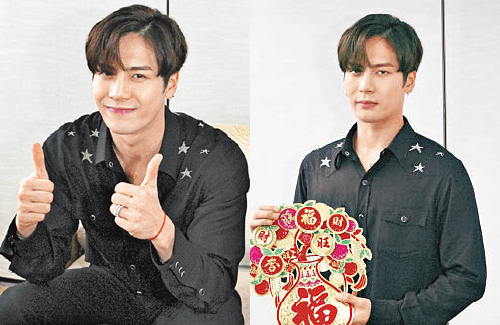 Besides being one of the coaches on the newest hit talent scouting show, Idol Producer <偶像練習生>, Jackson recently became an ambassador for Hong Kong tourism. With the Lunar New Year just around the corner, Jackson and the tourism team ramped up promotions in order to draw more attention to the Hong Kong tourism market. Taking part in a big parade on Lunar New Year, Jackson will be the event’s main MC that day. Proud to be participating in this year’s event, Jackson revealed that watching the parade with his family was a tradition in his childhood. Since he grew up Hong Kong, Jackson revealed he spent a lot of time watching TVB programs such as Virtues of Harmony <皆大歡喜>, Scoop <東張西望>, and Super Trio <獎門人>. Since airing, idol survival show Idol Producer has been gaining notice for its youthful and handsome contestants. Although Jackson was pegged as a harsh rap instructor, he actually quite friendly with some of the contestants. Jackson revealed that he is actually quite worried about Fan Bingbing‘s (范冰冰) younger brother, Fan Chengcheng (范丞丞). While praising Fan Chengcheng for his excellent sportsmanship and easygoing personality, Jackson said these could potentially be his weakest points as well. Because Fan Chengcheng is quiet and modest, he is also seen as a non-threatening competitor. As one of his coaches, Jackson hopes that all his contestants possess more ambition and competitiveness and hopes that Fan Chengcheng can learn to take initiative in getting more screen time to gain more public recognition. When asked about working with contestants he is currently friends with, Jackson said he will not be biased towards certain people just because of his relationship with them off-screen. Abiding by his own set of principles, Jackson said his job is to share his experience as an artiste so he can help and support the contestants along the way.